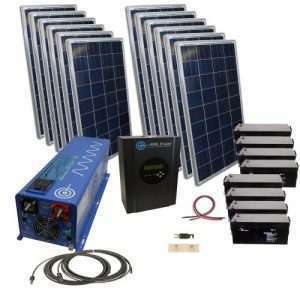 Inverters R Us stocks many complete solar and power inverter charging systems. These kits or bundles typically come with everything you need to harness and use the power of the sun for your power needs. Most of these kits will contain a solar panel(s), charge controller, power inverter, battery(ies), connectors, cables, fuses, remotes, mount etc. We also have custom solar kits in which you can pick exactly what components and accessories you would like to add, ensuring that your system will ship and arrive exactly how you would like it. We have everything you need to start your solar adventure, if you need help choosing what complete solar kit or system may be right for you, please don’t hesitate to give us a call today! The federal solar tax credit, or investment tax credit (ITC), allows both residential and commercial customers to deduct 30% of the cost of installing a complete solar energy system from their federal taxes until the end of 2019. In 2020, the rate decreases to 26% of the cost of the system, and in 2021 the rate drops to 22%. In 2022, things change drastically when commercial customers can deduct only 10% and there is no federal credit (0%) for residential customers.